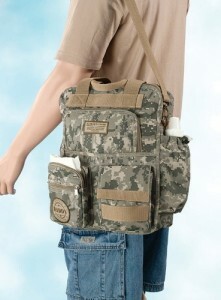 This cotton/polyester diaper bag is covered in modern camouflage. Zippers are used to close the pockets of this bag, which is designed to be carried over the shoulder. One side pocket is designed for a baby bottle (bottle not included). The bag measures 12.5″ x 16″. One lower pocket is accented with a round logo that reads “DADDY, Always Ready, Always There.” A rectangular logo near the top of the bag reads “FATHER’S CREED: I am a father. I have answered my child’s call. I will not quit. I will not fail.” Also available in Outdoor, Deployment and Genes versions.This cotton/polyester diaper bag is covered in modern camouflage.